The call for 2019 Innovative and Exemplary Respite Services has now closed. Please read about the 2019 Innovative and Exemplary Respite Services that were selected. The ARCH National Respite Network and Resource Center is seeking exemplary and innovative respite care programs and services* from across the nation. We wish to learn more about respite services that are evidence-based, that appear promising, or that are trying new service models and have some preliminary data or plan to collect data that demonstrate benefits to caregivers, care recipients, and family systems. For purposes of this application, respite care is defined as "planned or emergency care provided to a child or adult with special needs in order to provide temporary relief to family caregivers who are caring for that child or adult." We are also looking for respite services that address some challenging aspect of respite care delivery, such as reaching rural or military family caregivers, individuals with mental health and/or behavioral issues, grandparent or relative caregivers, or adults with disabilities and chronic conditions, for example. At this time, we are seeking innovative or exemplary practices for provision of direct respite services only, NOT for Lifespan Respite initiatives, which are defined as “'coordinated systems of community-based respite for family caregivers of children or adults regardless of special need," or related activities. Does the respite service attract and retain highly qualified respite providers or volunteers? 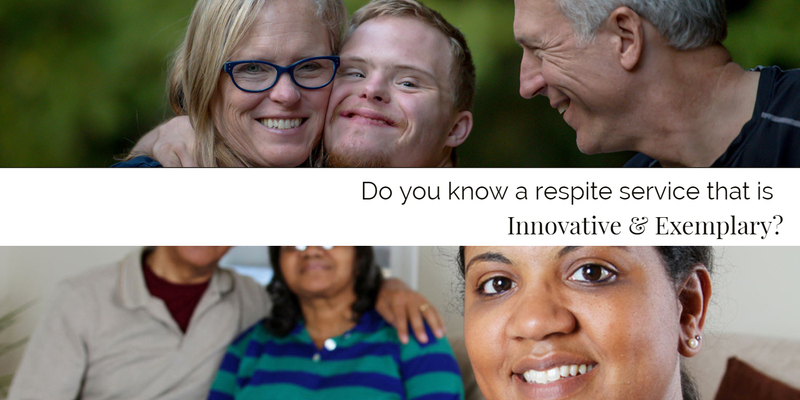 Does the respite service provide inclusive activities in the community that are enjoyable or meaningful for the care recipient and others? Does the respite service collect caregiver/care recipient/family outcome data that describe improved well-being and ability to remain at home (beyond just service satisfaction)? Does the respite service help family caregivers plan to make the most of their respite time by engaging in activities most meaningful to them? These questions are meant only to suggest examples of what might be considered exemplary or innovative and are not meant to be limiting descriptors. We welcome creativity! We invite you to nominate your service if you believe it is strong overall, or if it has areas of strength that you wish to share with others. If selected, your services will be recognized as a model for replication and highlighted on the ARCH website and in ARCH publications. You also may receive recognition at the National Lifespan Respite Conference. Up to three applicants who demonstrate exceptional respite services will be selected from the pool of identified innovative and exemplary services to be recognized at the National Lifespan Respite Conference in Buffalo, NY, in May 2019, with all expenses paid to attend the conference. How will ARCH use the information? to help advocate for new respite services, enhance existing services, and move toward evidence-based practices. Child or Adult with Special Needs: For purposes of this application, a child or adult with special needs is defined broadly to include a child or adult with a disability or chronic illness as well as a child or adult who may not have a disability or condition-specific diagnosis, but who has functional limitations, who may be at risk of abuse or neglect, homelessness, or who is otherwise vulnerable. Complete the short pre-application checklist below to see if your respite service qualifies. Complete the application online. See instructions below. Before you proceed with the application, make sure you meet the following minimum criteria. You must be able to respond YES to each of the three questions below before completing the application. 1. Have you been in operation for at least a year? 2. Do you have written guidelines for your respite service or an operations manual that you would be willing to share with ARCH and with others who might wish to replicate your services if selected as exemplary or innovative? If your respite service meets the above criteria, we invite you to nominate your respite service by completing the application by clicking the blue button below. The information you provide will be reviewed by a selection committee. If your respite service is selected as a possible exemplary or innovative service, ARCH will get back to you for more information and supporting documentation, including copies of your respite service guidelines or manual and your written plan for measuring performance before final determinations are made. Thank you for completing this application and your willingness to share information about your respite services. You will hear back from ARCH within 2-3 weeks of the receipt of your application. 1) You should complete the application in one session. You may not be able to save it and continue later. We suggest you review the questions in advance by reviewing a hard copy (pdf) of the application. 2) It is highly recommended that you draft your text responses in a WORD document, save it to your computer, and then cut and paste the responses into the appropriate text boxes in the online application. 3) You will not be able to print or save your responses. If you want to be sure to have a copy to refer to later, draft your responses in a WORD document and save them to your computer. 4) You can return to any previous page to review and edit your responses at any time until you hit the "Submit" button at the end of the survey. Once you hit "Submit" your application is considered final and complete. To navigate between pages, use the "Previous" or "Next" buttons at the bottom of the page -- do NOT use the back or forward buttons on your browser. *In the respite care field, the terms “program” and "service" are often used interchangeably or inconsistently. "Program" more commonly infers a comprehensive approach to family caregiver support that might include a respite component. For purposes of this application, we will use the term respite "services" rather than respite "program" to differentiate it from more comprehensive family support or family caregiver programs with multiple components. The respite service you nominate may be part of a comprehensive family caregiver or family support "program" or a stand-alone respite service.